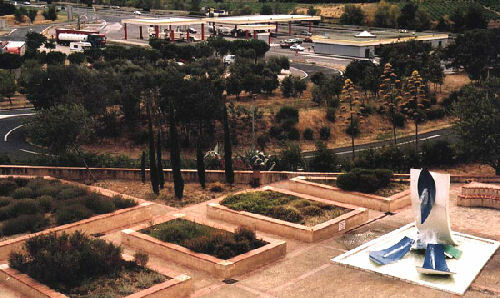 The land south of the east-west A61 autoroute, called the Plateau de Roussillon, became part of France in 1659. Catalonia, of which Barcelona is the capital, is one of the seventeen semi-autonomous regions of Spain. Perpignan, just to the north beyond the French border, was regarded as the second city of the principality of Catalonia during the 14th and 15th centuries. On the western, southbound side of the A9 autoroute that leads to Perpignan, the Spanish border and to Barcelona beyond, there is a large aire that includes shops, a café and a hotel [web page in French], as well as vast amounts of parking. With its theme of Catalonian architecture, this aire provides either a taste of Spain to come, or a reminder of places visited, depending from which direction you access this aire. 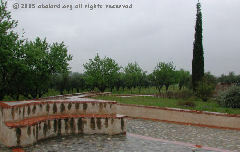 The eastern, northbound aire is more sparse and basic, with a pedestrian tunnel leading to the more interesting Catalan Village on the west side. This was the first themed aire from Autoroutes du Sud de la France (ASF), opened in 1975.
across the aire to the filling station. Sketch map locating the Catalan village aire. 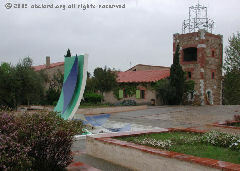 The Catalan Village aire, with shops, café and hotel, is only accessible from the south-bound side of the A9 motorway, when leaving Perpignan and going onto Spain. 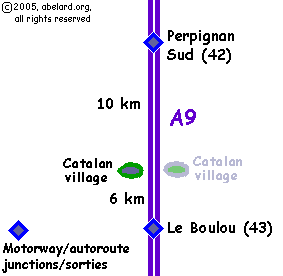 If you are approaching from the south (from Spain) and wish to visit the Village, either stop at the northbound aire and use the pedestrian tunnel under the autoroute, or overshoot to Perpignan Sud, exit the motorway and come back on the southbound direction. The northbound aire is very sparsely appointed by comparison. The Catalan Village aire is in Département 66 - Pyrénées-Orientales. 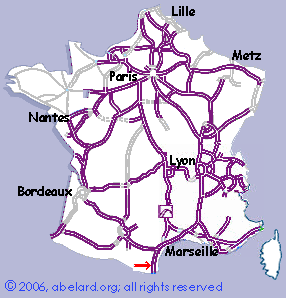 aire de services: services , motorway (GB) or freeway (US) service station.